The awkward tattoo a cheating husband got to win his wife back. Oh. A cheating husband voluntarily got an awfully huge tattoo to win his wife back. After being caught out cheating on his wife, Jose L. Torres decided there was just one way to win his wife’s trust back. He got an awfully huge, spelling error ridden stomach tattoo. Sprawling down his chest to just above his belly button, the tattoo read like an incredibly strange contract. 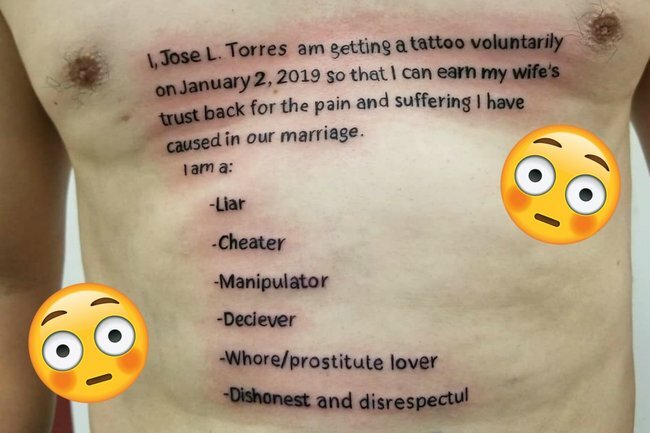 “I, Jose L. Torres am getting a tattoo voluntarily on January 2, 2019 so that I can earn my wife’s trust back for the pain and suffering I have caused in our marriage,” the first paragraph of the tattoo read. To make matters even worse, the tattoo featured the words ‘deceived’ and ‘disrespectful’ spelt incorrectly. Not only did the two paragraphs slant awkwardly across the man’s chest, they appear to be written in Comic Sans font. AKA the font that pretty much screams ‘don’t take me seriously’. Nice. In recent days, Torres’ awful tattoo has gone viral on Instagram and Twitter, with many pointing out that the man’s wife probably doesn’t want to be reminded of what he did. i guess its gonna be shirt on from now on? Better start saving for those laser removal sessions AND that divorce because they just guaranteed both????????‍♀️???? “Your second wife will love this,” one person commented. “Imagine what the next woman he’s gonna cheat with is gonna say when they say this,” another said. “I bet they will have a nice time if they go to the beach or any pool parties,” another wrote. We’re pretty sure Torres would be feeling a lot of regret right about now.